Data storage centers represent a major investment for any organization. This is true in terms of the value of the data to be stored as well as the physical infrastructure itself. Maintaining this investment requires implementing an environmental control system that has been designed to accommodate the needs of each particular storage center. Overheating is a serious threat to the function and longevity of storage center devices; however, the high cost of energy has led many companies to explore new approaches to cooling options. 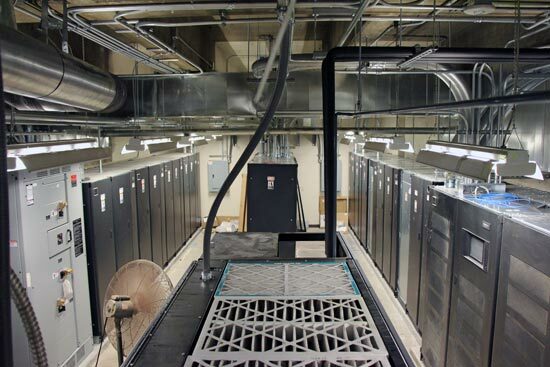 A hot aisle, cold aisle approach is a data center configuration solution that uses air flow to disperse heat. Managing air flow is an excellent way to manage cooling costs through a simple form of energy conservation. Though hot aisle, cold aisle configurations have a number of variations, at their most simplest it consists of server racks in rows with cold air intakes facing one way and hot air exhausts facing the other in a pattern of alternating rows. The aisles designated cold face the air conditioner’s output ducts. The hot aisles are positioned facing the air conditioner’s return ducts; they receive the outpouring of warm air from the cooling system’s exhaust. To prevent the cold and hot air from mixing and thereby diluting the cooling power of the environmental control system, containment measures have to be put in place. Traditionally containment was achieved through physical barriers. Though straightforward, this approach to containment did not fully realize the potential of this particular configuration. It is now more common to combine barriers with sophisticated variable fan drives. Plenums are part of the system’s configuration, too. A plenum is a space where air is allowed to circulate; it is separate from other spaces and is a traditional part of many building-wide ventilation systems. Titan Power adheres to all current best practices in order to bring out clients the most dependable data center services. Each center we design and build conforms to the very highest quality standards.